Freshwater Aquarium Photography This is the photography forum for the FW section. 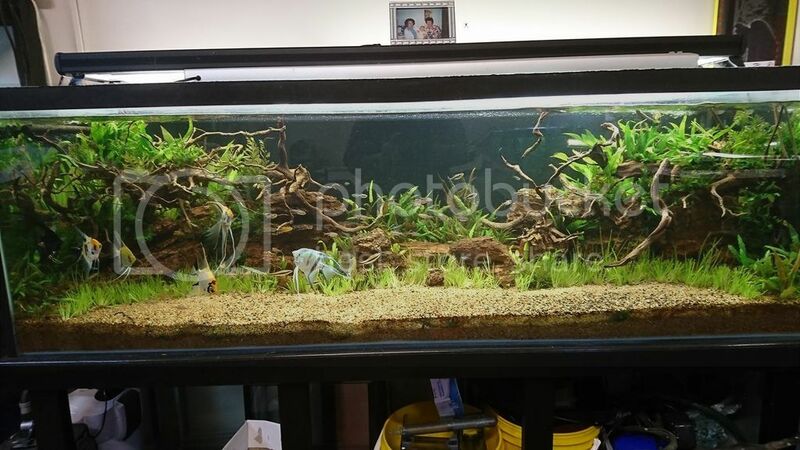 It's a dedicated forum to post pictures of some of the things in our tanks, pics of new additions, as well as for great information exchange, tips, tricks, and overall just discussing cameras and photography techniques of our tanks. Learn all about apertures, f-stops, ISOs, macro, flashes, white balance, and anything and everything else that drives us crazy to get a masterpiece shot. Feel free to show off your tanks in here, and plus its a great way for humble people to nonchalantly have their tanks nominated by the other members for Tank Of The Month. Don't be shy! I have recently bought and moved into my own house, all very exciting. Due to this i only have the absolute necessary tanks running, and the rest are being stored in Hubbies shed. (now around 40 or so tanks lol). 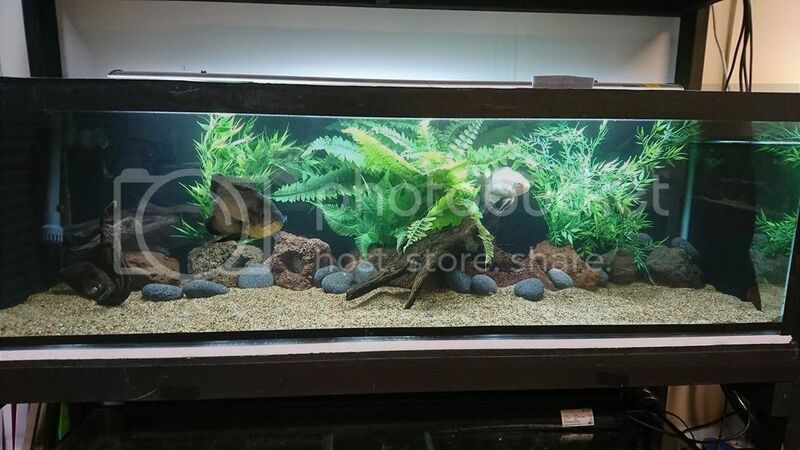 Due to the number of tanks i now have and the fact that i am wanting some more lol, i am getting a 6mx6m fish shed built, some of the tanks i have will go in, but eventually i will be upgrading to keeping mainly 4ft or larger. The shed will be fully insulated and lined and have 2 reverse cycles installed to keep the shed at a constant temperature. I am waiting for council approval, with the shed estimated to be up around Feb '17.....cannot wait! The only tank that will not be moving into the shed once it finished is the 6ft planted tank, the rest are pretty much temporary do ups. lonedove55 and SantaMonicaHelp like this. Looking amazing!!! 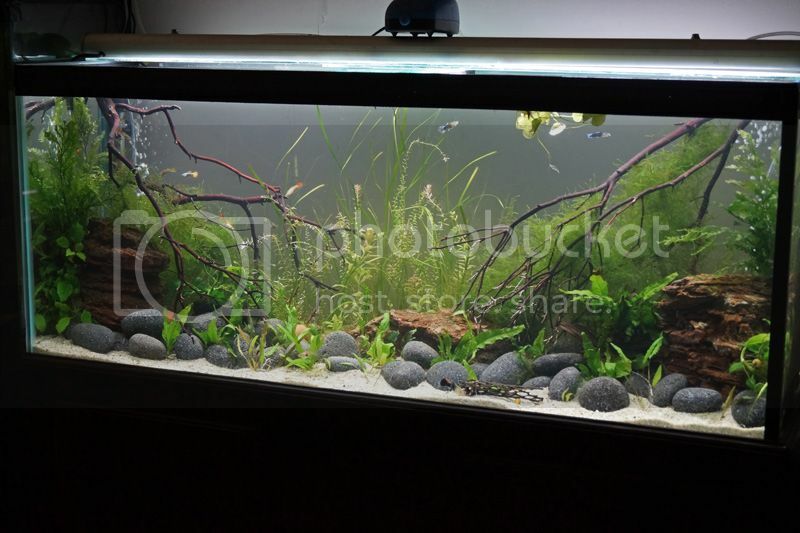 I am trying to sell my house and move into a larger one, so I am down to 19 tanks running, though no where near the quality you have! What type of eel(s) do you have? Can you post of pic of them? 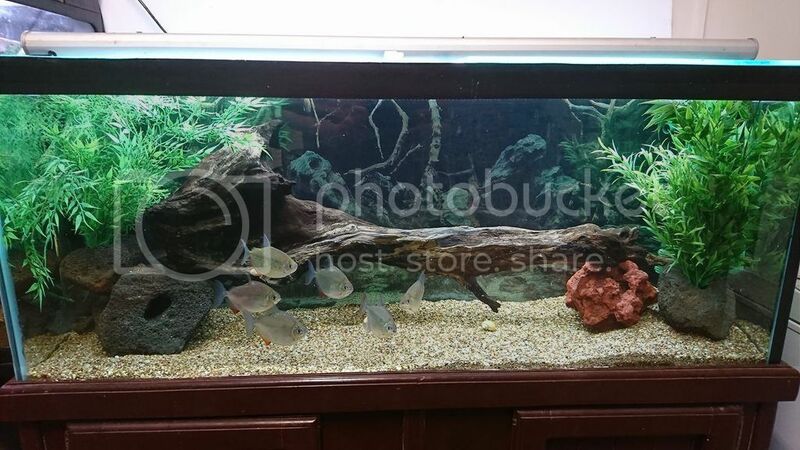 Those are beautiful tanks Alasse thanks for sharing them. 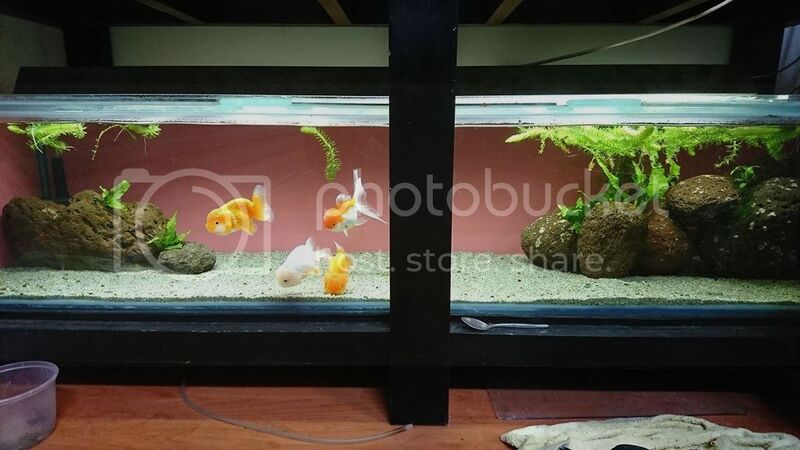 2 of the ranchu copped a flogging from the CAE (they really are a mongrel fish, nasty things! ), it chewed all along their backs, 1 of them is in a quite bad way, fingers crossed it will come good. I dumped in some multicure to keep any bacteria or fungus at bay while the worst guy and the other chewed on one try to recover. I will have to buy some salt , after the 3 days in the muticure, i'll do a large water change and add some salt to thicken up their slime coat, hopefully then they will just need nice clean water from many water changes.....poor babies. Ranchus: I lost one of the beaten up guys, the other has healed well but has a swim bladder issue. It is able to eat and get around, so i am happy for it to keep doing its thing. 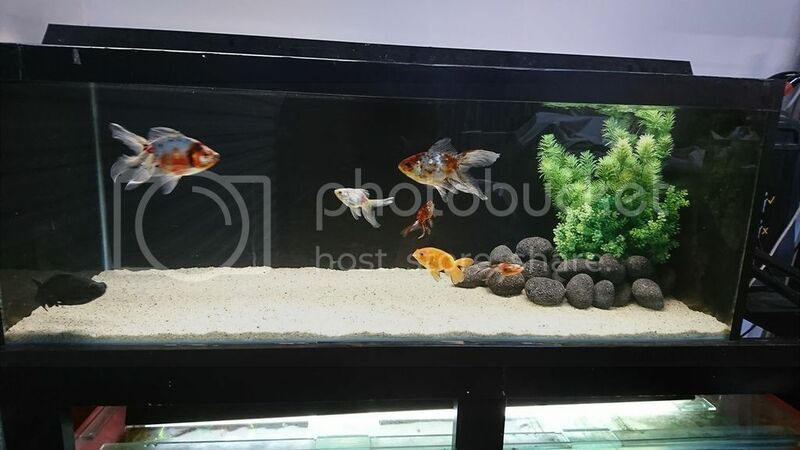 I have added a red cap oranda to the ranchu tank as it too has a swim bladder problem. 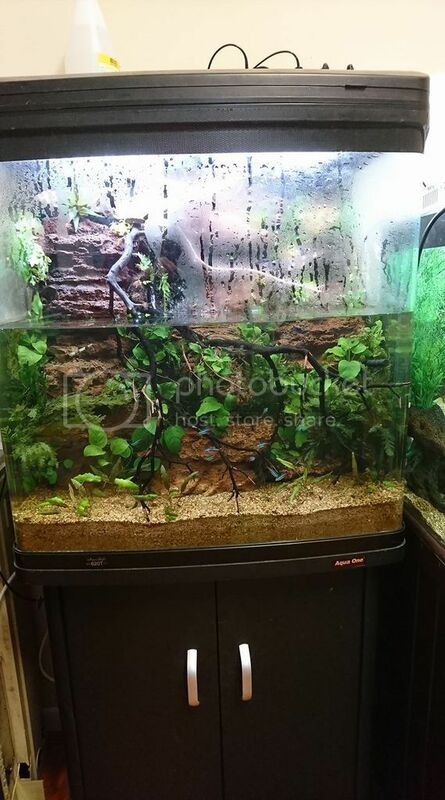 I figure the shallower tank will make it a bit easier for the bladder guys to get around etc. Shed: The concrete slab has been poured...the shed itself has been delivered in flat packs ready to be assembled on Monday. Getting there!! Peppermint Bristlenose: So these guys had not been breeding, and i had not been encouraging them, as i will need to move them into the 'pleco rack' once the shed is ready. But......they had other ideas lol, i now have pep fry in the tank! 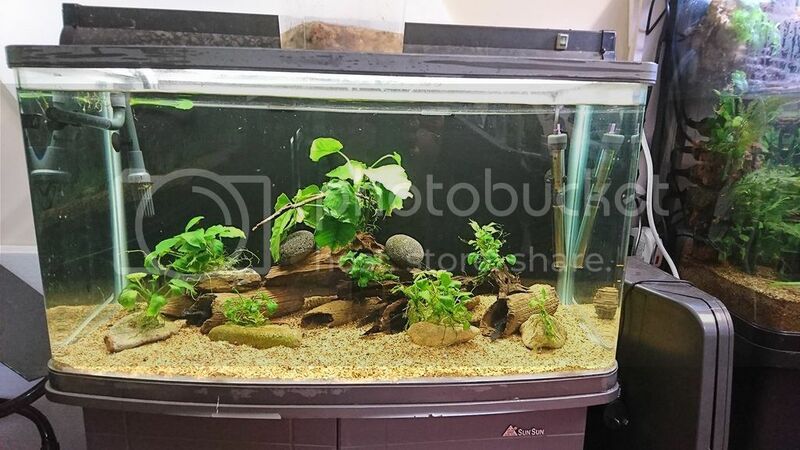 Paludarium: I decided to have a go at one of these, as the tank is only in a temporary spot until the shed is done, i figured i could have a trial run and if successful i will get a larger custom tank made and do up a more permanent scape. Loving it so far! Tank quotes: i have got some quotes to get some new tanks made....one will be a 4x4x2 (possibly 2) and 3 more 6x2x2 and a 8x2x2...quite a few dollars and may take a little bit to get but they are in the plans. Gizmo and lonedove55 like this. Your tank looks so incredible!!!! How is it now? Do you make any changes?